Yesterday my friend Emma got me thinking about something I rarely think about: women in prison. Emma has been working with Keeping the Faith – The Prison Project. 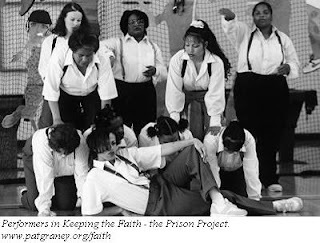 It’s a non-religious arts program aimed at helping incarcerated women develop a sense of identity through writing, movement, and visual art. Lately they’ve been working with the idea of “legacy” – the women in the program talk and write about the legacy they’ve been left by their families and the legacy they’re leaving to their children. Many of the women in the program didn’t complete high school; some have been in prison multiple times. Emma says they feel and are treated “like they’re worth nothing” on a daily basis, so considering the idea of legacy – leaving their mark in the world – is a heavy task. About 1,500 women are in Washington state prisons right now. Nationwide about 115,000 women are in prison. The Women’s Prison Association reports that female imprisonment has grown 757% since 1977. Plus, the rights of women in prison are often violated in hideous ways – for instance, through the practice of shackling women prisoners during childbirth. An entire generation of women faces a preposterously increased likelihood of spending time in prison. What is society saying to them about what they’re worth? What legacy are we leaving them?